A court in Morocco has given a heavy jail sentence to an Islamist militant, Saad Housseini, for his involvement in bombings in Casablanca six years ago. The blasts, in May 2003, killed 45 people, including 12 suicide bombers. Housseini was given a 15-year sentence, while his fellow conspirators were given shorter terms. He is also wanted in Spain where he has been accused of making the bombs that killed 191 people on commuter trains in Madrid in 2004. An anti-terrorist tribunal in the Moroccan capital, Rabat, heard how Housseini, a chemistry graduate, had gone to Afghanistan for training in bomb-making and other lethal techniques. 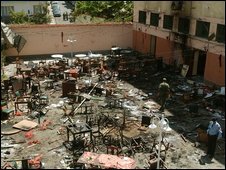 The bombings in Madrid were said by al-Qaeda supporters to be to be revenge for the presence of Spanish troops in Iraq; the troops were later withdrawn.